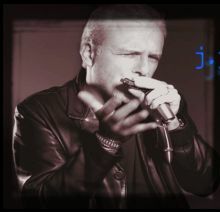 Jean-Jacques Milteau (born 1950 in Paris) is a French blues harmonica player, singer, and songwriter. Milteau became interested in the harmonica when he first heard folk and rock music (such as Bob Dylan and The Rolling Stones) in the 1960s. He played with French singers like Yves Montand, Eddy Mitchell, Jean-Jacques Goldman, Maxime Le Forestier, Barbara, and Charles Aznavour in various styles, from blues to jazz. In 1989, he recorded his first solo album, Blues Harp, and toured the world with Manu Galvin at the guitar and with guest musicians like Mighty Mo Rodgers and Demi Evans. He has authored methods for learning the harmonica.